Gilbert is a biologist working for The Peregrine Fund’s Madagascar Project and has been responsible for directing the creation of the Tambohorano wetland protected site in western Madagascar since 2007. In 1999, he began his DEA degree with TPF’s Madagascar Project studying the nesting ecology and behavior of Peregrine Falcons in the central plateau and southwestern Madagascar. 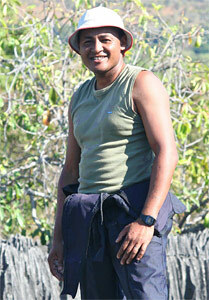 He received his DEA diploma in biology, ecology and conservation from Antananarivo University in 2001. In 2002, he began working for The Peregrine Fund’s Madagascar Project where his responsibilities included supervising students, managing the project’s database and conducting Madagascar Fish Eagle surveys. In 2005 and 2006, Gilbert conducted a country-wide survey for Madagascar Fish Eagles. In 2009, he began his doctorate thesis on Madagascar Fish Eagles and the impact of the local resource management system at the Manambolomaty Lakes Complex in western Madagascar. He has a keen interest in nature, especially birds, and also soccer.